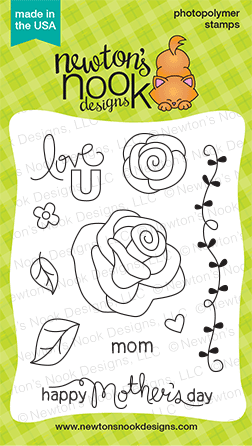 Newton's Nook Designs: Happy Mother's Day! Hello & Happy Mothers Day! I just wanted to pop in with a quick hello and share a couple Mothers Day cards I made using our Love Grows set! The first card is nearly a "one layer" card. I masked out the center with an oval and then stamped the roses and sponged all around it. Then I used the blank center to add my sentiment as the focal point. This card is simple and sweet but turned out very pretty, I think! For this next card I also used the Love Grows set. 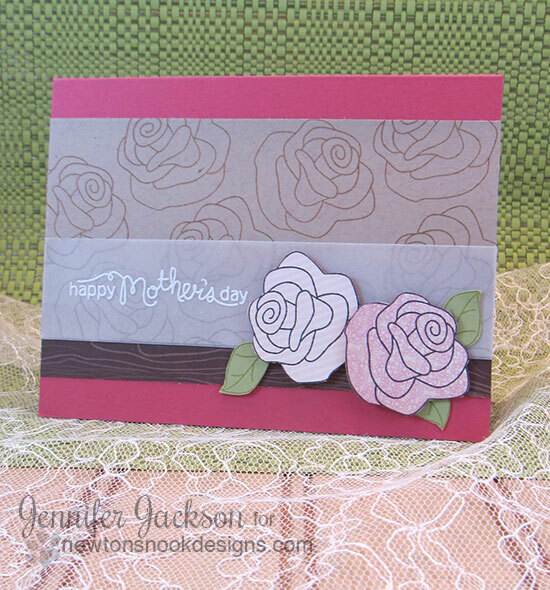 For this one I created a subtle background by stamping brown roses on kraft colored card stock. Then I stamped a couple on subtle printed papers and paper pierced them out. I also stamped the leaves on green and fussy cut them out too. I added sentiment embossed on vellum and a piece of woodgrain paper finishes it off. I didn't even use twine or ribbon on this one - imagine that! Hope you enjoyed the rose cards today! Have a great Sunday! Beautiful cards! Moms receiving these would be tickled pink with not only how pretty these are, but with the thoughtfulness that went into creating them! Absolutely gorgeous :) Such a beautiful use of color and elements! Lovely cards - great stamp set.